Abcam’s SIRT3 Activity Assay Kit (Fluorometric) (ab156067) detects SIRT3 activity in lysates. Primarily, the SIRT3 Activity Assay Kit (Fluorometric) is designed for the rapid and sensitive evaluation of SIRT3 inhibitors or activators using crude SIRT3 fraction or purified SIRT3. 1. Screening inhibitors or activators of SIRT3. 2. Detecting the effects of pharmacological agents on SIRT3. NAD-dependent protein deacetylase. Activates mitochondrial target proteins, including ACSS1, IDH2 and GDH by deacetylating key lysine residues. Contributes to the regulation of the cellular energy metabolism. Important for regulating tissue-specific ATP levels. Belongs to the sirtuin family. Publishing research using ab156067? Please let us know so that we can cite the reference in this datasheet. 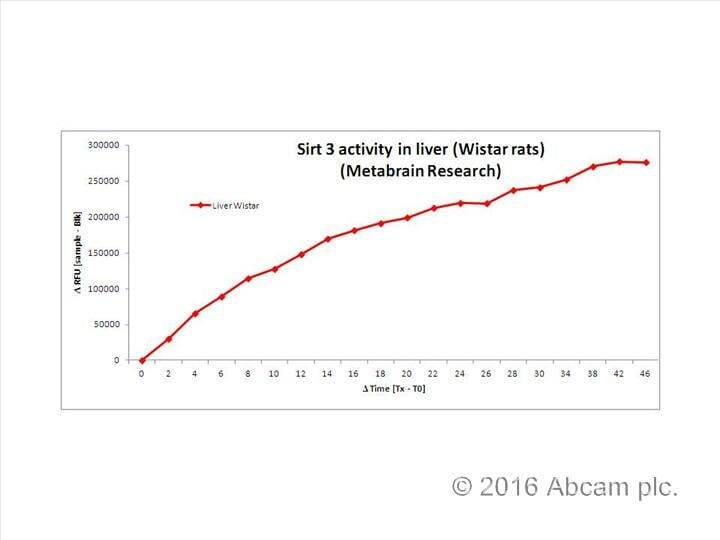 While Sirt 3 activity was easy to measure with the recombinant enzyme, RFU levels from crude liver lysate of Wistar rats were very low. Finally, after several settings (buffer, fractionation, washing steps, etc...), sirt 3 activity was detected in liver of Wistar rats, under our specific experimental conditions. I would like to use this kit (ab156067 sirt3 assay kit), in order to measure endogenous SIRT3 activity in cell. According to the cover sleeve the kit is intended " For the quantitative measurement of SIRT3 activity in cell lysates". 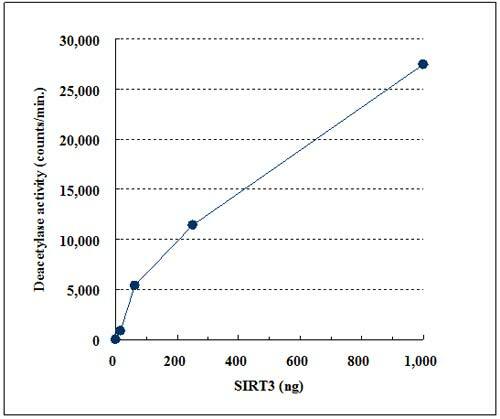 However, after reading the booklet, i understand that is not possible to measure endogenous cellular SIRT3 activity with this kit, which only detects activity of recombinant or immunoprecipitated SIRT3 protein. Is that right? Can you confirm my question? I am happy to confirm that crude cell lysate can be used as samples with this kit but as this often needs a lot of optimisation we would recommend to prepare mitochondria and use a mitochondrial lysate. https://www.abcam.com/index.html?datasheet=110171 (or use the following: https://www.abcam.com/index.html?datasheet=110171). https://www.abcam.com/index.html?datasheet=110168 (or use the following: https://www.abcam.com/index.html?datasheet=110169). 1) How specific is the assay? There are two other SIRT proteins in the mitochondria, and both are NAD dependent. It seems as if this assay will measure activity of all of these proteins, no? 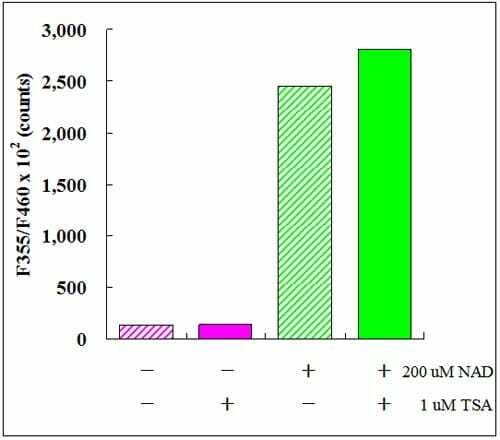 2) What is the difference between the mitochondrial isolation kit and using a normal Triton/Digitonin protocol for mitochondrial extraction? 3) Are intact mitochondria required for the SIRT3 activity assay, or are mitochondrial extracts enough? 4) Would it be possible to receive a test sample of either of these kits, to see if they work for what I want to do before buying the whole kit? I assume you are referring to SIRT5 as the second SIRT protein? We know that SIRT1 (recombinant) can catalyze deacetylation from the substrate of SIRT3 Activity Assay Kit (Fluorometric) and SIRT2 cannot. We don't know about SIRT5. The kit comes with optimized detergent concentrations to isolate mitochondria and an optimized isosmotic buffer to reduce swelling. We haven't used SIRT3 Activity Assay Kit (Fluorometric) with native SIRT3 samples ourselves. Unfortunately, we do not offer test samples of our products due to logistical issues. However, all our products are covered by our 1 year Abpromise guarantee which states that if the product does not work as stated on the datasheet, we will replace or refund the product. Is the Recombinant SIRT3 made from baculovirus? Is it full lenght or fragment? The recombinant SIRT3 was made/refined from colon bacillus. It is a fragmented protein from the N terminal, plus made to be around 10kDa size (process was not carried out within the cell).